What does it take to become a successful blogger? Hard work is a good start. Many of the most linked to Swedish blogs post several times per day. This will not be a discussion about quality vs quantity, but an analysis of statistics from the blog portal Knuff.se tells us that the most linked to blogs are very frequent bloggers. 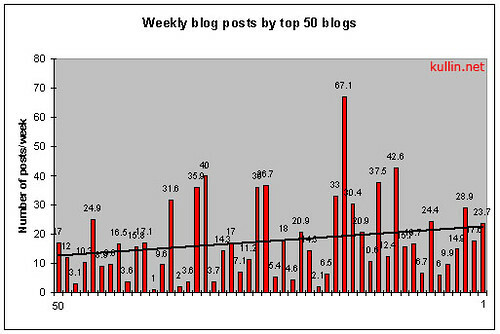 The trend line suggests that the very top blogs post more often than those lower down ont the top 50 chart. The average number of weekly posts among these 50 blogs is 17.59 posts per week, which is quite a lot. But there are huge differences between for example piratbyran.org (average 1 post/week) and the hardest working blogger in Sweden: Beta Alfa 2.0 (average 67.1 posts/week). Footnote: Stats are for top 50 as of Wednesday this week. Tags: A-list bloggers, posts, bloggare. Ping.